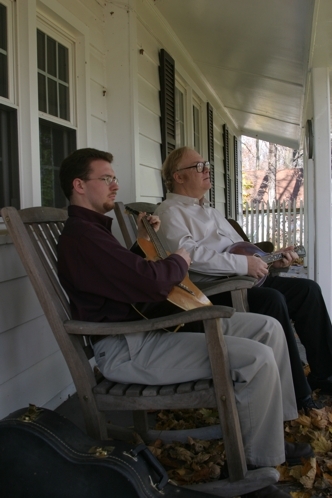 For some reason, my inbox here at Fiddlefreak is full of old-time mando-guitar duet records that harken back to the glory days of old-time gospel and pre-bluegrass country music, before those terms were even used. And let me tell you, my loyal reader, I’m hearing some mighty fine songs on these new CDs. Let’s get started with a new release from Jeremy Stephens and Tom Mindte titled “Radio Favorites & Sacred Songs” (Patuxent CD-215). For fans of the Monroe Brothers or the Louvin Brothers, this record is as satisfying as a fried chicken at the Sunday church potluck. Jeremy, a relative newcomer to recording and performing, says “some of the first traditional music I ever heard was Dock Boggs, so I’ve always loved old time music.” Jeremy—-you dropped the right name! Here are two songs from this fine new recording out of Patuxent Music in Rockville, MD. Enjoy.